“Samsung Z2 makes 4G accessible and relevant to the unique needs of feature phone users and first-time smartphone buyers. It brings consumers a fast and affordable mobile internet experience that will democratize 4G usage in the country.” were the words of Mr. Manu Sharma, Samsung India Electronics. The latest smartphone comes with 3.97 inches IPS-LC capacitive touchscreen with 16M colors. The device runs on Tizen OS v2.4 and powered by Spreadtrum chipset and a quad-core processor. The company is offering 8 GB internal memory with 1 GB RAM on the device. The internal memory of the device is expandable using a microSD card. The company has provided quite a low-level camera with the device. There is a 5 MP primary camera with LED flash on the back and VGA secondary camera on the front. There is a 3.5mm audio jack embedded in the device. Other common connectivity options like WLAN, Bluetooth, GPS, USB and FM Radio are also available with the device. There is an accelerometer sensor in Z2. There is a small removable battery of 1,500 mAh in this gadget. Z2 also offers 4G network technology. There are some pre-installed apps like My Money Transfer which will easily transfer the money from one bank account to the other bank account. Like the Samsung smartphones, this device also supports S Bike Mode. This mode lets tension free ride for the two-wheeler users in India. The device also supports 12 regional languages which give the local touch to the smartphone. For the music lovers, Samsung Z2 have full access to Jio Beats, offering millions of HD songs in over 20 languages.There is also an Ultra Data Power saving mode which blocks the unnecessary background applications and saves the data of the customer. The company is selling the device in Gold, Black, and Red color. 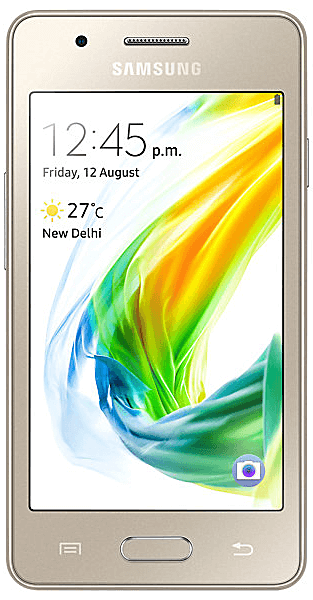 Samsung Z2 is priced at Rs. 4,590 (around $70). This will be available from 29 August and retailer PayTM for online selling of the device. PayTM was feeling proud to take the responsibility for selling the first ever 4G Tizen-based smartphone. For more information, ask a question in the comment box below. Stay tuned to The Reporter Times for more updates.